March 19, 2012, 3:44 p.m. The British TV network’s “rolling news stream” is the latest site redesign to take cues from the social media feeds that are changing how we skim through the news. By Adrienne LaFrance @adriennelaf March 19, 2012, 3:44 p.m.
British network ITV unveiled a bold new look for its news site Monday — one that favors newness over editorial control, rethinks what a “story” is, and takes inspiration from the Twitter and Facebook streams that increasingly influence how people get their news. ITV calls the new site, developed with the London firm Made by Many, a “rolling news site,” and it shows: It serves up a seemingly bottomless stream of bite-sized content, newest at the top. Like Twitter, the stream of content automatically expands when you scroll to page bottom. If a new update is posted while you’re reading the page, a note appears at page top to alert you to it, à la “4 new Tweets” on twitter.com. You might call it the streamification of news design, or an echo back to the reverse-chronological flow of posts that has defined blogs since the late 1990s. News operations born online — think Techcrunch or Engadget — have leaned toward a design language that always highlights the newest work produced by its staff. But newspapers and broadcasters have, broadly speaking, been more invested in making editorial and layout decisions about where stories appear on their front pages. Think of it as the Page 1 meeting that never ends. ITV’s new look is a step away from that. Content-wise, ITV is posting mostly quick hits, limited to a couple of paragraphs or shorter. The stream is also populated with headlined Twitter posts from newsmakers or journalists. The result is a somewhat frenetic newsfeed that at times more closely resembles a reporter’s notebook than a traditional story. That doesn’t mean editorial control disappears. ITV selects a few stories at any given time to be highlighted in the left sidebar. But “story” in this case doesn’t mean 15 inches of narrative — a “story” is closer to the StoryStream model of SB Nation or The Verge, a series of discrete dispatches on the same topic. So if you wanted to know more about an ITV story — say, the Duchess of Cambridge’s first public speaking appearance — click “Kate gives first speech” and you’re taken to a stream of 10 short items about the story, ranging from the initial announcement to an assurance that “Kate’s speech ‘all her own work'” to “Duchess arrives” to video of a speech coach rating her performance. The whole thing’s topped by a link to the full, traditional story ITV did to wrap the event. 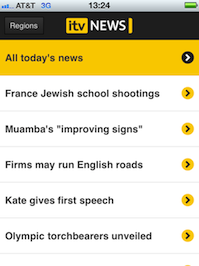 ITV also presents news streams by beat — politics, business, money, health, etc. — and by region. Each region serves up a unique sidebar of stories. Visit the site from an iPhone and you’re directed first to the story list, then allowed to view the full stream or dive into a topic. The central idea is to deliver customized, dynamically generated content to readers who are doing one of two things when they visit a news website. With its redesigned site, ITV News is looking to cater first to the skimmers, and then to the diggers. The new aesthetic is a significant departure from the site’s more traditional previous iteration, which looked much like ITV’s current homepage. March wouldn’t provide specific numbers but he says traffic to the site on its first day has been “extremely encouraging,” and that the overall site roll-out was remarkably smooth. More news sites are experimenting with stream-like design approaches. We wrote in January about Boston.com’s experiments with a stream on one of its hyperlocal sites, and it seems likely we’ll see more Twitter-inspired looks. March says the new platform is perfect for reporters who are “absolutely chomping at the bit” to get information out. The way it works: ITV correspondents from two national desks and nine regional desks send original reporting updates to a team of curators who are already aggregating wire copy, tweets, and other stories for the site. POSTED March 19, 2012, 3:44 p.m.
LaFrance, Adrienne. "Embracing the stream: ITV’s new Twitter-inspired news site breaks the day’s news into pieces." Nieman Journalism Lab. Nieman Foundation for Journalism at Harvard, 19 Mar. 2012. Web. 18 Apr. 2019. LaFrance, Adrienne. 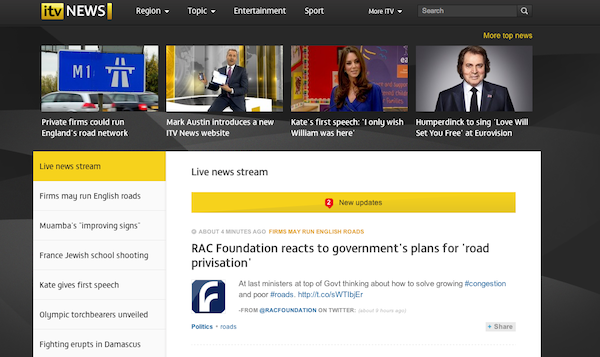 "Embracing the stream: ITV’s new Twitter-inspired news site breaks the day’s news into pieces." Nieman Journalism Lab. Last modified March 19, 2012. Accessed April 18, 2019. https://www.niemanlab.org/2012/03/embracing-the-stream-itvs-new-twitter-inspired-news-site-breaks-the-days-news-into-pieces/.